Mamallapuram is a well known tourist destination in South India. As a World Heritage Site situated on the east coast of South India, it is a repository of architecture and sculpture created by the Pallava dynasty in the 6th and 7th century CE. In spite of the bustle of tourists it is in a way a mysterious place. Little is known about the Pallava emperors who build it, why they built it and why it was built here. A little away from this busy tourist spot, across a bridge on the other side of a little back-water, stands an unremarkable pavilion. It looks insignificant and isolated by the side of the road. But the unexpected and unknown treasure it contains is in its own way as mysterious, as significant, and as valuable as the World Heritage Site of Mamallapuram, I could say . From Chennai the East Coast Road leads south to Mamallapuram and onwards to the former French colony of Puducherry. It is advertised as a scenic thoroughfare for tourists and well maintained. As one passes by the rocky outcrop around which the monuments of Mamallapuram are situated the road crosses a back-water across a bridge. Just to the other side of the bridge, away from Mamallapuram proper on the west side of the road, there is a small, unobtrusive mandapa or pavilion. Many times I passed this way I thought of stopping the car for a closer look, but the pressure of appointments and the thick bushes and greenery surrounding the structure worked against this impulse. But this past summer something had changed. The bushes had been cleared and the pavilion was clearly visible and reachable. So I stopped and took a closer look. It is a simple construction of four rows of six pillars covered by a flat roof (Figure 1). The inner structure is divided into a front porch between the first and second row of four pillars, while the second till sixth row have been placed on a raised floor (Figure 2). It is divided into a central aisle, adjoined by a right and left aisle. The central aisle is slightly wider and the roof is also a little higher compared to the side aisles. The back side has been closed at some time in the past with a brick wall which has partially collapsed and also a kind of porch of brick has at one time been constructed between two pillars on the right (Figures 3 and 4). The four pillars that constitute the front and entrance porch are of a more elaborate design than the others. Many pillars are only partly finished and a handful have been left unfinished completely (Figure 5). The podikai of the inner pillars is of the simple T-shape first used by Rajaraja Chola in the Rajarajeshvara temple in Tanjore (1000 CE) . The front row of pillars are capped by a podikai that evolved under the later Chola dynasty, with the element that would in later centuries evolve into the shape of a banana flower still very low in relief, pointing to the period of Kulottunga Chola I (1070-1120) (Figure 2) . The bases of many pillars have nicely carved low-relief depictions of deities and mythological figures (Figure 6) . The pillars of the front porch also have several human figures carved on their base, most likely the donors responsible for the building of the pavilion (Figure 7). Two of these are especially peculiar. Carved in a very different style two figures in the costume of 17th century European traders (Figure 8 and 9) adorn the base of the outer pillars. The upper portions of the inner pillars also have been decorated in many cases but this carving is of a very poor quality, rough, and depicts mostly simple geometrical figures (Figure 10). I felt slightly disappointed. It was nice work from a distant period, in a way a little bit confused in its unfinished and undetermined state. Somehow I had been excited and had had some unconscious expectations. I made one last round, took some more photos and made up my mind to go back to the car, when something tugged from the back of my mind. Something made me look up at the ceiling, and there it was! The treasure I had unconsciously expected. First my eyes caught the depictions of several eclipses. But there were also fish and both strange and known animals. But the most exciting relief was right above me, in the center of the porch-section of the pavilion. An elaborate lotus-shaped medallion was flanked on its left by a sphinx or purushamriga, and on its right by the depiction of Kannappa, a well known saint, sacrificing his eyes to the bleeding Shiva Linga in a well known episode from Shaiva legend (Figure 11). This is what had been tugging on my mind. All through my research on the sphinx in Indian art and tradition I had experienced that I was directed by some intuition, finding sphinxes in the least likely places through some unexplained mental radar. One of the very few sphinxes I had found not through my own field work but from the literature was actually just a kilometer away. It is the sphinx in the Krishna cave in Mamallapuram . Once again I was surprised at the individuality of this particular sphinx. As I have had opportunity enough to observe before, the sphinxes depicted in Indian art all show an unusual individuality . Once again the sculptor expressed the concept of the mythological being with the body of a lion and a human head in a unique way. The sphinx is especially known for his devotions towards Shiva, and the bell in his hand refers to his ceaseless performance of Shiva puja (Figure 12) . Opposite, on the other side of the medallion, the relief tells the story of saint Kannappa. He is one of the 63 Nayanmars, the saints from the Shaiva tradition. He was a hunter who worshipped Shiva with offerings of meat. A Brahmin priest who also offered worship to this Shiva Linga in the forest became very upset, because from his understanding the offer of meat was inauspicious. He hid to see who it was that left the meat. When Kannappa came to offer his worship he found the Shiva Linga (which was a Mukha Linga, with a human face) bleeding from one eye. Without any hesitation he took one of his own eyes and gave it to Shiva. The eye stopped bleeding, but then the other eye started bleeding. With astonishment the Brahmin watched Kannappa prepare to take out his other eye. To make sure where to put the eye he used one of his toes to mark the bleeding eye of Shiva. With one of his arrows he was about to rip out his remaining eye, shaming the Brahmin into the realization that, although maybe the manner of worship was un-orthodox, the depth of Kannappa’s devotion was beyond measure. Thereupon Shiva appeared from the Linga and blessed Kannappa for his devotion. In the scene on the ceiling of this simple pavilion by the side of the ECR just outside of Mamallapuram Kannappa is marking Shiva’s bleeding eye with one toe, while gauging out his remaining eye with one of his arrows (Figure 13) . The legend of Kannappa is well known and the story of his unflinching devotion is often told and depicted. The legend of the sphinx or purushamriga has been all but forgotten and the places where a living tradition still exists are few . One is the pilgrimage of the Shiva Ottam, the Running for Shiva, in Kanya Kumari district, where in the night of Maha Shiva Ratri devotees run 80 kilometers to worship in 12 temples that have been established as the result of the race between Bhima and the sphinx or purushamriga . Here in Mamallapuram by the side of the ECR, the sphinx and Kannappa, both known for their devotion to Lord Shiva, flank an elaborate lotus medallion. The sculpture is obviously intended as the main focus of the pavilion, but it would not be possible to decode its meaning were it not for the context of the sculptural program presented here on the ceiling. It is the depiction of several eclipses that offers us at least one clue for understanding the sculptural program . The time of occurrence of both solar and lunar eclipses are considered especially sacred in the doctrine. It has always been a time for kings to offer donations and grants and for devotees as an opportunity for spiritual achievements of uncommon potency . Eclipses have therefore often been commemorated by depictions in relief in temples (Figure 14 and 15). And in the epigraphy we find many references to both lunar and solar eclipses . These depictions take the form of a naga or cobra undulating before an orb. Sometimes the sculptor has indicated whether a lunar or solar eclipse is intended. For instance two of the four eclipses depicted here on the ceiling show the orb as a moon. Once by showing the moon sickle within the orb (Figure 16) and once by showing the rabbit people in India see in the face of the moon (Figure 17). Two other nagas undulating before a globe therefore could be interpreted as solar eclipses (Figure 18 and 19). Two more nagas are part of this extensive sculptural program on this ceiling. Two cobras move towards one another holding something in their mouth but without any orbs. This relief may or may not be eclipse related (Figure 20). Within the whole of the ceiling (Figure 21) we can recognize several subordinate complexes of reliefs that belong together as well as very probably relate to the other complexes within the whole in a mysterious way. On the left side of the main central relief of the sphinx, the lotus medallion and Kannappa, the figures of a Ganda Bherunda, a human faced scorpion and a simple lotus medallion with 8 petals are situated in a triangular arrangement (Figure 22). On the opposite side of the front porch crouches a strange animal with a small deer seemingly being chased before it (Figure 25), a solar eclipse, a pair of fish that face one another and a lunar eclipse (Figure 16) heading in the opposite direction of the solar eclipse (Figure 18). In the central aisle a subordinate complex includes a pair of fish, two monkeys, one of which carries a baby monkey, a whale, a moray eel swallowing another animal or fish (Figure 27), and a lotus medallion consisting of a center and two layers of petals (Figure 31). At the back of the central aisle we find another pair of fish together with the depiction of one of the solar eclipses (Figure 19). The right hand aisle offers three smaller complexes of reliefs. The first consists of a fish, the lunar eclipse with a rabbit depicted in the lunar orb (Figure 17) and a lotus medallion with two layers of petals (Figure 32). The second includes another pair of fish and a pair of fish accompanied by a tortoise (Figure 35). And lastly, at the end, another pair of fish. The aisle on the left offers the reliefs of one fish next to a lotus medallion of just eight petals in a circle (Figure 33) accompanied by a very mysterious animal I have not been able to identify so far (Figure 37). Slightly further we find the two nagas and in the back a human faced scorpion faces a tortoise or turtle (Figure 38). The two headed bird is known in Hindu mythology as Ganda Bherunda, literally, two-necks (Figure 24). It is a very ancient symbol and was known as early as the Hittite period between 20 centuries and 13 centuries BCE . It is also an alchemical symbol and is used in Free Masonry . This ancient the symbol is often found in heraldry, for instance of the Holy Roman Empire, the Byzantine empire and also the Indian empire of Vijayanagara . Today it is still the symbol of the royal family of Mysore . This mythological bird is worshipped in a few places in Andhra Pradesh and Karnataka, where it is sometimes interpreted as an incarnation of Vishnu . It is thought of as having magical strength and depicted as holding elephants in its claws and lions in its beaks. It plays its own role in the Shiva Purana. Suggested meanings are solar, protective, the union of male and female energy within the individual. Here the Ganda Bherunda is placed opposite a scorpion with a human face (Figure 23) and next to both these is a medallion with an eight-petalled lotus (Figure 22). In the context of the eclipses an astronomical or astrological meaning is suggested. The pair of monkeys of which one carries a small monkey, the whale and the moray eel catching a pray combine to make an unusual relief (Figure 27). Their proximity to one another suggests a relationship. The animals are depicted very realistically. Especially the monkeys are realistic and the moray eel is very recognizable (Figure 29 and 30), the whale is depicted somewhat more abstract, but could be identified as a sperm whale (Figure 28). The subject matter is very unusual for Indian art, but somehow the artists must have had detailed knowledge of these sea animals to depict them in this way. The prey animal of the moray eel is not completely recognizable, but could be a sea turtle. Another outstanding characteristic is the multitude of depictions of fish, mainly in pairs (Figure 34), but also individual fish are depicted (Figure 17). The main key to the understanding of this sculptural program lies with the eclipse depictions. Eclipses were, and still are, considered events of great spiritual significance. An auspicious time for the performance of special vows, and especially also an auspicious time for giving ritual gifts. In the epigraphical record we find numerous references to donations made by kings and others on the occasion of lunar and solar eclipses. Some kings stand out particularly for their attention to eclipses through the offering of substantial gift to temples, individuals or groups. The Western Chalukyan king Tribhuvanamalla Vikramaditya VI (1076-1126 from Kalyani) offered gifts on the occasion of at least eight eclipses that occurred during his reign. Some other kings famous for their eclipse donations are the Yadava Simghana II (1200-1247 from Devagiri), and several kings of the Hoysala and Vijayanagara dynasties . All ritual is organized and directed through the almanac, as sacred time is one of the most important aspects of the Vedic and Agamic rites. Eclipses are predicted by the almanac with accuracy . The inscriptions that recorded the donations are often accompanied by depictions that show the sun and the moon approached by a cobra, representing the immaterial planets Rahu and Ketu, the lunar nodes which cause eclipses . Such depictions are also sometimes found in temples (Figure 14 and 15). In this pavilion just outside Mamallapuram we find four eclipses depicted, and a possible reference to more, in the pair of cobras that face one another without the presence of a lunar or solar orb. There can be no doubt this pavilion with its unusual ceiling decorations was erected to commemorate a time of great spiritual, astronomical and astrological significance to the builders. The figures are all unusual and carry unfamiliar symbolic significance by themselves, but the full meaning is generated through the whole of the ensemble. Eclipses, both lunar and solar, can occur only twice in a year and their occurrence is ruled by strict natural laws . In any place on earth eclipses will occur only very occasionally and seemingly irregularly. Sometimes a particular area will not witness total lunar or solar eclipses for many years. A total solar eclipse is more exceptional, as the area where it can be seen is always only a very narrow band across the surface of the planet. Sometimes several occur close in time of each other. In the context of Indian spiritual practice such times would be considered to be of heightened and auspicious significance. We focus on total solar eclipses because they are a rare event to witness, even compared to total lunar eclipses that are always visible across a much larger area. When we look at the solar eclipse data for South India several such periods stand out. Especially the 12th century and the 13th saw several clusters of solar eclipses, the majority of which is also recorded in epigraphy . In the 14th and 15th century solar eclipses occurred far less frequent over southern India . 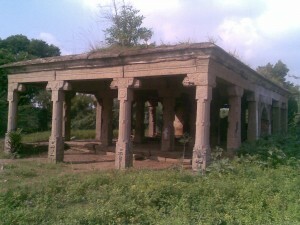 The architecture, the style and subject matter of the sculpture of this pavilion very likely point to the 13th to 14th century. In the 14th century very few eclipses occurred over South India. The 13th century saw several clusters of solar eclipses, total and partial, that are also referred to in the epigraphy. It is through the significance of some of the other figures that we will offer an interpretation of the time period this pavilion might be related to. Without doubt the central relief is the lotus medallion flanked by the Indian sphinx or purushamriga and the saint Kannappa with the Shiva Linga. It is placed in the center of the front porch part of the pavilion. Both the sphinx and Kannappa are first and foremost Shiva devotees. But the center of the scene is without doubt the lotus medallion made up of three concentric circles of lotus petals around a center. Both the sphinx-purushamriga and Kannappa with the Shiva Linga are focusing towards this medallion. It is a most unusual scene suggesting significance beyond both the decorative quality and the spiritual meaning of the lotus symbol in general. In view of the whole of the sculptural program depicted on this ceiling it suggests the lotus medallion here may convey the spectacle of a total solar eclipse. When the corona of the sun becomes visible as the light of the sun itself is blocked by the disk of the moon it generates some of the most exciting visions known to humanity. This ensemble may even suggest a specific date, placing the pavilion and its sculptural program in an explicit time-frame. It was mentioned earlier on that one of the traditions the sphinx or purushamriga is connected to is the Shiva Ottam which takes place every Maha Shiva Ratri near Kanya Kumari . It is a one-night pilgrimage when devotees worship Shiva in 12 temples that came into existence when the sphinx pursued Bhima, one of the Pancha Panadavas, the heroes of the epic Mahabharata. To avoid capture by the sphinx Bhima threw small lingas over his shoulder which had been given to him by Lord Krishna. Each small linga turned into a Shiva temple, obliging the sphinx to perform his worship to Shiva before continuing his pursuit of Bhima. Mahashivaratri, the great night of Lord Shiva, is celebrated on the night of new moon in the Tamil month Masi , which at present falls between the 15th of February and the 15th of March. Seven hundred years ago it would have fallen some days earlier relative to the Western calendar, but because we are concerned here with the New Moon day that does not have any impact on the identification of the date . On the day of Mahashivaratri of the year 1300 CE a total solar eclipse took place over or very near to the place of this pavilion near Mamallapuram. The maps presented in the website of NASA show the path of totality of this eclipse was over the eastern Bay of Bengal (Figure 41), but the uncertainty of the DeltaT in the formula used to calculate the path of solar eclipses offers the possibility that this eclipse actually crossed over Mamallapuram at the time . In the seven years before this the path of totality of two more solar eclipses crossed over southern India. On the 5th of July 1293 the path of totality crossed over the area around Kanya Kumari and on the 28th of October 1296 it crossed over the area of the central Deccan plateau, Andhra Pradesh, and possibly also Mamallapuram (Figure 40) . In the same period there were an unusual high number of total Lunar eclipses in this part of the world; 1284 (2), 1287 (2), 1291 (2), 1294, 1295 and 1298 . Is this lotus medallion intended as a symbol of the spectacle of a total solar eclipse? Could we suggest the other lotus medallions are also associated with solar or possibly lunar eclipses? One is directly next to the depiction of a lunar eclipse in the right aisle (Figure 32). In the central aisle the lotus medallion is situated next to the panels with the monkeys, whale and moray eel (Figure 31 and 27). In the left aisle an eight petalled lotus is depicted next to a fish (Figure 33). And another lotus with eight petals accompanies the panel with the two headed eagle or Ganda Bherunda and the scorpion with a human face (Figure 22). Could these figures be understood as having astronomical or astrological significance? Does the whole sculptural program of the ceiling suggest a astronomical and astrological significance? A documentation of actual astronomical observations by those who built this pavilion? The fish could refer to the Mina Rasi, the constellation of the Fish, but can also be understood as the emblem of the Pandya dynasty which ruled from Madurai . The scorpion could refer to the Vriscika Rasi, the constellation Scorpio, in which the solar eclipse of the 28th of October 1296 took place. This eclipse is referred to in a copper plate inscription of the king Devagiri Yadava Ramachandra . The possible connection of other figures with astronomy or astrology is indefinite. The moray eel, whale and monkeys may signify a symbolical connection we are no longer aware of, or may point to unusual behavior by these animals observed during eclipses. The tortoise shown opposite the human faced scorpion in the left aisle could also have astronomical significance which can not be ascertained at this point. The tortoise that accompanies the pair of fish in the right aisle may also be interpreted in this context. We are left with the interpretation of the two unknown animals in the front porch (Figure 25 and 26) and the left hand aisle (Figure 37). This last one cannot be identified at all at this point. It is crouching, with a long tail and a strange head, with the sculptor indicating some kind of striped fur. The one in the front porch is even more enigmatic. It also crouches with long claws, a long tail which curls at the end, striped fur, and also has a strange head. The deer shown in front of it seems to be fleeing, possibly looking back in fear. Also the purana of Mahashivaratri is associated with a deer. An orb of some kind rests on the shoulder of the strange animal. From the surrounding reliefs it can be expected these animals also could be related somehow to the whole complex of astronomical meaning found depicted on the ceiling. This isolated pavilion looks on the outside quite unremarkable but its content is at the same time so mysterious. It carries unusual observations of astronomical events of a far away age. It shows how these significant astronomical events were experienced by people of long ago, who built this pavilion in commemoration. I could say it is like a time-capsule with images in stone of eclipses experienced by those people who built this pavilion so many centuries ago.